Trinity United Church was originally a Wesleyan Methodist Church. From about 1790, traveling Methodist preachers held services in homes or small chapels throughout this areas. They traveled on foot and by horseback, covering large areas called "circuits" and became known as "circuit riders" or "saddle-bag preachers." The first church on this property was a small frame chapel, 30' by 40', built in 1824 and dedicated November 28th. The building cost 300 pounds. At that time, the population of Cobourg was about 100 people. 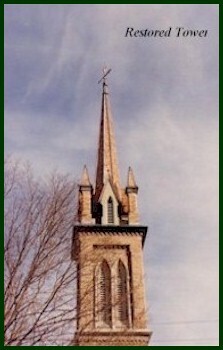 In 1852, the frame chapel was replaced by a larger brick church of simple Gothic design, with tower and spire, seating 390 people, . The architect was William G. Storm of Kingston. The west half of our present church, including the main entrance and the north and south porch entrances date from this time. The interior at that time had exposed beams across the ceiling, and pews closed by partitions with small doors. The gallery stairs at the back date from 1860. The church was enlarged to accommodate the growing population of both town and Victoria College. A parsonage was built on the north side of Chapel Street in 1872. Sold in 1992, it is now used for commercial purposes. A Sunday School Hall was built beside the parsonage in 1881. Used as a Sunday School until 1959, it became the Cobourg Public Library until 1995. Reconstruction and expansion of the church was undertaken in 1900-1901 to accommodate an increased membership due to the union of the several branches of Methodism in this area. 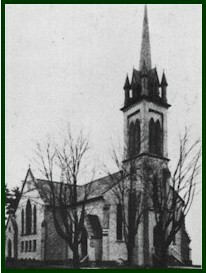 Renamed the Cobourg Methodist Church, the building was enlarged by the addition of the transepts and a new chancel and organ loft. The interior was redesigned with arches, stained glass windows, and new semi-circular pews of oak and ash Trinity United 1900 purchased from Waterloo, Ontario. The oak railing and woodwork in the chancel were purchased from Messrs. Henderson Bros., local contractors, and members of the congregation. The sanctuary seats approximately 800 people. The Artisan Classic Organ, a computerized 71 stop digital instrument, is an example of state of the art organ technology. It was installed in 1995. The ornamental pipes enclosing the organ loft no longer speak as they once did. This sanctuary has excellent acoustics and is often used for concerts and recording. On June 10, 1925, the United Church of Canada was born. The union of the Methodist, Congregationalist and some of the Presbyterian churches brought into being the largest Protestant denomination in Canada. The name, Trinity, was chosen by ballot in 1926. Three years of planning, working and praying brought to completion the addition to the church property known as the Christian Education Centre. Dedicated on June 25, 1960, the building cost approximately $200,000. It contains an auditorium, library, offices, Sunday School rooms, ladies' parlour, kitchen and basement play area. An historical restoration of Trinity United Church was begun in May, 1989 and completed in time for the rededication service on June 10, 1990. The project entailed replacing and repairing brick work, installing a new cedar roof, rebuilding the minarets and steeple on the bell tower, and installing a new floor in the basement of the sanctuary. New lighting for the exterior of the sanctuary was added, and the north and south porches were rebuilt. One goal of the restoration was to replace the finial on top of the steeple, which represents a hand pointing to heaven, and serves as a weather vane. There are only four examples of this hand in North America, all located on churches built in the 1850's. Prepared by the Archives committee of Trinity United Church. For more information, you can obtain a copy of the congregation's history A Journey of Faith, from the Church Office, or contact the church Archivist.